Please refer to our stock # 3084 when inquiring. 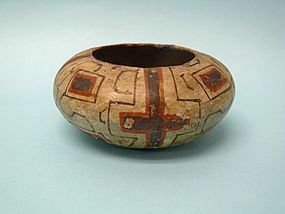 Early 20th Century Shipibo Pottery Olla, Peru. Polychrome in pigments of brown, cream, rust, and red. 2" High x 4 3/4" Diameter. Repair to rim and some wear due to age and use, but in excellent condition. Ex: Ex: Helena & Ladislas Segy collection (Segy Gallery New York, 1950 - 1988) acquired 1950s - 1980s. The Shipibo-Conibo live in the 21st century while keeping one foot in the past, spanning millennia in the Amazonian rainforest. Many of their traditions are still practiced, such as ayahuasca shamanism. Shamanistic songs have inspired artistic tradition and decorative designs found in their clothing, pottery, tools and textiles. Some of the urbanized people live around Pucallpa in the Yarina Cocha, an extensive indigenous zone. Most others live in scattered villages over a large area of jungle forest extending from Brazil to Ecuador. Shipibo-Conibo women make beadwork and textiles, but are probably best known for their pottery, decorated with maze-like red and black geometric patterns. While these ceramics were traditionally made for use in the home, an expanding tourist market has provided many households with extra income through the sale of pots and other craft items.